Motorists have been asked to drive with caution. IT’S COLD AND frosty in many places this morning with patches of freezing fog. AA Roadwatch has asked drivers to exercise caution as road temperatures are below zero on a number of routes with temperatures as low as -2.9°C on the N81 in Baltinglass, Co Wicklow. There are reports of fog in several areas, including Carrick-on-Shannon, Cavan town and Tullamore. Met Éireann says outbreaks of showery rain and sleet will affect parts of the west and south for a time but will have cleared by the afternoon. Otherwise it’ll be dry and bright with sunshine at times. Temperatures will hit four to six degrees. There’ll be clear periods overnight with lowest temperatures around freezing. 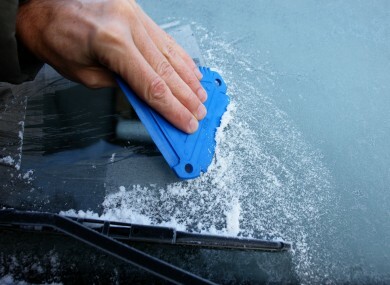 Widespread frost is set to be an issue again with further patches of freezing fog. There will also be scattered wintry showers in the south. Tomorrow morning will be frosty again. Outbreaks of rain will affect the east and south, but it will be generally dry in the west and north for much of the day. Highest temperatures will range from four to seven degree, with light southeasterly winds. Email “Frost and sleet as temperatures dip below freezing in many areas”. Feedback on “Frost and sleet as temperatures dip below freezing in many areas”.